Where Can I Find Patterns for Crocheted Baby Shoes? Before we begin I'd like to make sure you've had a chance to see Dr. Vincent Ianbelli's informative article about baby shoes. It's important to understand that Dr. Iannelli recommends waiting until a baby is walking before dressing him or her in shoes. Pictured at above right: Erica Jackofsky designed these crocheted baby booties that resemble a pair of Mary-Jane style baby shoes. Cute, aren't they? They're a fantastic unisex pattern. What do you think? 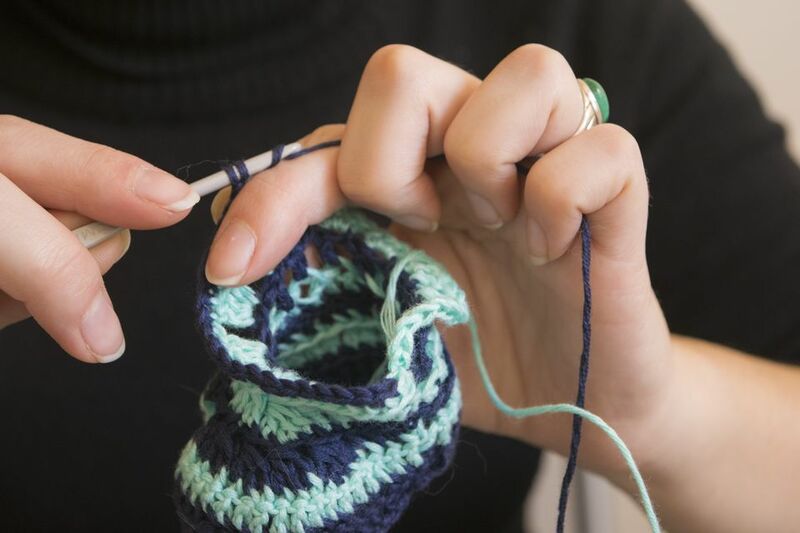 Free crochet patterns for socks -- This link takes you to a variety of different sock patterns in a broad range of sizes; there are sock patterns appropriate for everyone in the family, including babies and children. I don't have a separate page featuring just baby socks; many of the patterns on this page are multi-sized. by Robyn Chachula features an outstanding, versatile baby sock pattern. Additionally, there's a cute pattern for baby boots -- not booties, actual boots -- plus many other baby patterns. If you think you might like to make several baby projects, this book would be a good one to consider. This crochet pattern book is published by Interweave Press. Dressing Up Baby by Darla Sims features crochet patterns for five different baby layette sets. Each layette set includes four items: a pair of baby booties, a baby blanket, a little sweater, and a hat to top it all off. This crochet pattern book is published by Leisure Arts.